High-energy optimist meets medium-core runner…and a little randomness thrown in! The first week of cross country has been awesome. And surprisingly easy. Our hardest day was hardly hard because it was the minimum of what I do any day I run. I have to say, so far the hardest parts of cross country have been getting up so early and running EVERY. SINGLE. DAY. The other hard part is running every day. I’m not used to that. My muscles are soooooore. But I do like getting the exercise every day! I definitely need it! My six-pack is closer to disappearing then it has been for a long time. So, I need the exercise but I also need to get my “healthy eating” back on track! Initiate: Natural Food Week. I’m going to try to eat only natural foods this week. See, during the school year I eat quite healthily but over the summer I kinda went crazy on the sugar. Now that we are on the countdown back to the school year I need to get my healthy ways back on track. Wish me luck, people! I sure will need it! As I already said, the hardest day of practice so far was a three mile interval run. It was hard cause we had to hold the same pace the whole time but I did that, I beat out some of the girls, I impressed the coaches. It was awesome. I was proud of myself for that and I was also thankful that my previous coach (being myself) insisted that I always run a minimum of 3 miles. It made that interval run a heck of a lot easier. It’s been one of those weeks. Or two of those weeks, I suppose. Also, I feel as though I don’t have much to write about at the moment, because I haven’t been running. Or I hadn’t been running. This week has been different. Okay, firstly I ran three miles on Saturday with my brother. We were slow. But it was a good run that was definitely worth the time it took. When you don’t run for awhile, you want to run again, but you’re also kind of scared to go back. Once you run again though, your determination is renewed and you’re back in the game. I ran with my brother and my friend this Tuesday. We ran four miles. They were slow. Slow, but glorious. Because running is glorious. After that run I had so much energy. I cleaned my room, I folded my clothes and I did school. I even made my bed which I never do, even when I have energy. =) I was so glad to have running partners though, because 1) they got me out there in the first place and 2) they kept me going at a pretty good pace. 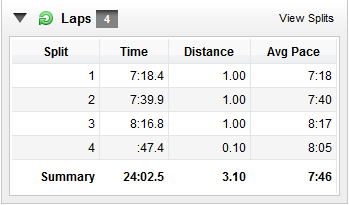 Those splits were very encouraging because my average pace was about ten seconds faster than the previous run. Even though I killed myself to go that pace, it was so worth it. Then there was today. I wasn’t planning on running. I was tired. I was bored. And, okay, I’d just eaten a bowl of chocolate frosting. I was wearing running clothes so I figured I might as well run. I don’t even know what to say. When I looked at my Garmin during the first mile and saw that my time was a 7 minute mile, I wanted to leap for joy. I knew that I couldn’t hold that pace for the whole run, but getting at least one sub-8 minute mile under my belt was good. Getting two was even better! And before long, I will be back on track! Cross country, which starts in less than a month, will only get me faster! On a rather sour side note, after today’s run, my lower right shin was killing me. I walked around and stretched it out. But it still really hurt. I stretched it more and took an ice cold shower. It’s okay now but I’m kind of dreading waking up tomorrow. This isn’t the first time that’s happened. It hurt after Tuesday’s run. And Saturday’s. I’m really hoping it’s just cause I haven’t stretched it out enough and that if I just keep stretching that it will go away. But do any runners out there have any suggestions as to stretches I could do or other remedies for my sore shin? Due to my laziness and lack of interesting things to write about running, we missed a very important date! July 28, 2011: my first-ever blog post. Man, I have changed a lot since that day. Thank God. I like reading my old blog posts though. They are entertaining in a kind of embarrassing sort of way. I used to post more pictures though. I should start posting more. Now, where is my camera? Any other ideas on how I can further improve my blog? Truth be told, I was more surprised it happened than you all probably are. You probably just thought, if you thought of me at all, something like, “Well yesterday she said she was going to run today, so she probably will!” No, see I like to think that I am a resolved person. If I make up my mind to do something, then I will do it. And that is mostly true. But there is one exception. And that’s when I’m tired. I’m the worst tired person in the world. I’m crabby and lazy and emotional. It’s not fun to be around. I’m going to be honest: When I got back from my job I had no plans of running today. I figured I’d just do it tomorrow (famous last words). But something happened. I don’t really know what it is, just like this urge or craving to go run. So I did. It was really hard. Like insanely hard. It was a beautiful day for running though. It’s about 80 degrees but really breezy and altogether beautiful. But still. I hadn’t run for almost a week. And I haven’t really been cross-training unless we’re counting freezing in a pool for 3 hours as some sort of exercise…which I suppose that is pretty good fat burn (nah, I’m just kidding about that last part… 😉 ). I was a little out of shape to say the least. And then there’s this hill I have to run up at the end of my route. It is not steep. But at this point, it is a killer. I feel that burn of an empty stomach. Running running running. And I can barely breathe but WHO CARES? Cause I just finished four miles! That’s one extra mile than required by my coach during every run. And now, I feel fantastic. As I always do. And I’m so glad I went. As I always am. Generally when I do lists I at least get up to “ten” so you must be wondering what happened yesterday night. “Did she really only learn THAT measly amount of tricks from the TWO years she has been running?” you asked yourself (probably not really…)! The answer is no. I just got kicked off the computer and told to go to bed. So here’s Part 2. 1. Always run, at a minimum, the number of miles you set out to run. Otherwise the entire run was a waste of time because you won’t be content with the results. 3. Run, even when you’re tired. Sometimes, the run will give you more energy from endorphins thus waking you up. And if that doesn’t happen, at least you will feel good about accomplishing something. 1. Always, ALWAYS stretch. Do not embark on your run until you feel sufficiently stretched. You will know when you have reached that point. Trust me, you can tell the minute you are completely loose and limber. Wow. Did I really just say that? 2. Don’t hold it until after your run. I have this weird little mentality where I try to get out on my run as fast as I can. More than once, I have rushed out the door without using the bathroom first. Usually it’s fine. But if you think you can hold it until you get back, you are wrong. When you run, everything’s jiggling around inside and it really only makes things worse. So, GO before you go. 3. Don’t assume that cars will stop for you. Even though technically they are supposed to. You cannot assume that they are looking through their windshield at you and not down at their phone in their lap. Just, be careful. 4. Always plan out your route ahead of time or at least a couple minutes in advance. This makes things so much easier so that when you get up to the fork in the road, you already know which way you are turning. Also, if you keep changing your mind and switching directions, you can get really mixed up and lose track of where you are. For more advanced runners, this is a lot easier because there’s only so many routes you can take from your house. 5. Memorize the mileage from all possible routes leading away from your starting point. For me, the “starting point” is my house. I can tell you exactly how far away we are from our house up to a 2 1/2 mile point in any direction. That is very convenient for planning out a route in your head while you are running. 6. Pick music with a fast beat. It sounds stupid but listening to music with a faster beat actually DOES help you run faster. When you’re tuned into your music, your feet get into the groove. If you’re listening to slow music, you will most likely run slower. 7. Stick to main roads if you aren’t sure how far you are going to be able to go. This is probably the best trick I have up my sleeve and here’s why: You run on the main road. You run however far out and then turn around and run back. But if you’re having a really good run, then you can branch off onto a little road, run for a block on the street parallel to the main road and then run back up to the main road. It adds easy distance and if you can figure it right you can add on miles to a normally short run. Magical. 8. Do NOT run right after eating. Unless you are looking for a laxative (see #2). Also, if not the first it will lead to painful cramps. For the first time in (I looked) TWO WEEKS! I thought I would be horrendous. Also, I couldn’t stretch very much before hand because I have all the blisters on the back of my feet from shoes. Like, what the HECK! I thought summer shoes were supposed to be comfortable?! Anyways. I ran. A LOT faster than I had expected. AND! I didn’t even run only the required three miles! I ran four. It was fantastic. -Ly hot. But also just fantastic! Today was a cool day. It was like 88 degrees or something when I went running and I kid you not, it felt cool! It’s crazy what a change ten degrees can make! We all kept saying, “Oh this weather is so nice! How relieving!” even though normally this would qualify as hhhotttt! So, despite the fact that generally I wouldn’t leave my nice air-conditioned room in this heat, I went for a run cause it felt cool! And I ran a sub-8 minute mile also!!! 7:49 minute mile, which I think is PRETTY good for my first day back after that looooong break! A couple of days ago I was all set to write a fantastic blog post. I had it all planned out in my head what I was going to say and it was gonna be just GREAT. Unfortunately, it was also eleven at night. So, I just wrote down my idea and went to bed. Of course, the next day rushed by and I never ended up writing that blog post. So here I am. Anyways. The above-mentioned blog post was GOING TO BE about barefoot running. I never understood WHY there is such a big thing about it right now. I mean, half the reason I like to run is because I get to use all my fancy running merchandise. WHY would I want to run in my bare feet when I could run in my fancy hot pink Nikes? Why why why? Another reason this never appealed to me is because I have very high arched feet so I need lots of support when I’m running or else my feet hurt. And my ankles. And legs. It’s a mess. So, I’ve always preferred running withshoes. And I’d never tried it any other way either. It’s been very hot lately. I woke up at 6:30 this morning and it was 84 degrees. Seriously? Anyways, because of the heat and humidity and all that fun stuff, I have not been running. In fact, the last time I went on a legitimate 3-mile run (it’s not legit if it’s not three or more miles!) was a LONG time ago. I don’t really remember the exact date. And I don’t want to check on my Garmin cause I am pretty sure knowing how long it’s been since I last ran will make me cry. A couple days ago, I was shooting hoops outside. By myself. That’s how I’ve spent the majority of my summer. But that’s NOT what this post is about. Anyways, so I’m outside in the driveway, in my bare feet (key words here) and I’m thinking about how much I miss running. So, I suddenly get this urge to just run. But I didn’t feel like going upstairs and changing into all my running stuff cause that would totally ruin the “impulsive-ness” of it all. So I just start off down the sidewalk. At first, I was like, “I’ll just go around the block.” But I got to the end of the block and I wanted to keep going. So I did. I probably ran no more than a mile, about five minutes. And I was drenched when I got back. And my feet were sore and a little shredded by various pebbles. (Nothing that can’t heal though!) It was awesome. And. I’d forgotten how nice it was to run without music pounding in my ears. So, I’m now a convert. I’ve decided that running bare-footed is a great idea. My mom is not convinced. So I guess I’ll stick to shoes. Anyways. Because of this huge storm we had last Sunday, the pool has been closed all week, so we didn’t have any swimming. I have been a VERY inactive little girl. But I’m pretty sure today made up for that. It was our first day back at swimming and usually on Fridays we only practice for half an hour and then we play games. But today? We swam 8 200s and then 1 100. NOT FUN. And you basically get no rest between the sets so it really felt more like a 1600. NOT FUN. But it was good to exercise and truthfully, even though I was dying while I was actually swimming, once we finished I felt great. So, all’s good. Today I’m going to the pool to babysit. I think I’m going to run there. Hey, 2 miles is something right? Click for the insights of Claire. The latest on her life. God & Running... it's all here. Click for me.